Microsoft launched a cool new tool for flattering — or offending — anyone with a few free minutes to kill. 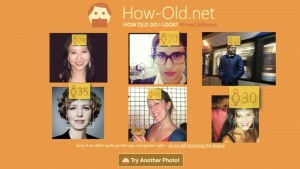 Upload a selfie or type your name into the search bar at how-old.net to do Bing image search, and Microsoft’s “How Old Do I Look?” tool takes a stab at guessing your age and gender. People are sharing their results with the hashtag #HowOldRobot. Microsoft is playing a dangerous game. Guess too high and people are offended. Guess too low and they think the tool doesn’t work. Guess right on the nose and they’ll probably wish it had low-balled by a few years. The company announced the site at its Microsoft Build developer’s conference in San Francisco on Thursday. It’s meant to show off the power of Microsoft’s face detection API tools and its Azure computing platform for developers. Part of Microsoft’s Project Oxford, the Face Detection engine can also detect the same person in multiple photos. (You can test its face-matching tool clicking here) Third-party developers can use these features in their own apps, say for photo editing or sorting through a library of images. When Microsoft originally sent an email asking people to test the tool, it didn’t predict that it would go viral. But vanity is a funny thing, and in a few hours, more than 35,000 people had used the site. After its shout-out onstage at the conference Thursday, it quickly spread on social media where many people were shocked to find that Microsoft overestimated their age, sometimes by several decades. It also grossly underestimated some testers’ ages, but they were far less likely to complain.